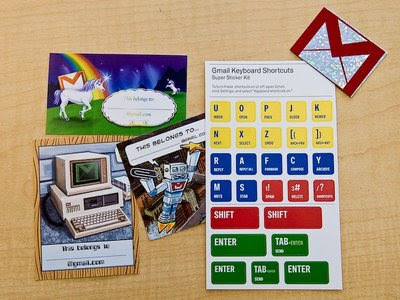 Similar to my free "Powered By Ubuntu" sticker offer, Google is answering the call for free stickers by offering free Gmail stickers in a variety of assortments so you can show off your Gmail pride! I am pretty excited about this. I have been an avid Gmail user for a while, and I love everything about it. That, and I'm always down for some free stickers to put on my laptop. As I have found out through my own sticker offer, some of you don't know what "self addressed stamped envelope" means. For those who don't it means you stuff an envelope with another envelope that is addressed back to you with with some friggin' postage on it so they can mail the stickers back to you. For more information about the sticker offer visit the Official Gmail Blog.